Faced with the bleak panorama of post-war Europe and the difficulty that the European states encountered to meet their debt payments, in 1948, US Secretary of State George Catlett Marshall launched an ambitious plan to aid European recovery: the European Recovery Programme, better known as the Marshall Plan. One of its objectives was to prevent the American economy from falling into recession as a result of the problems associated with the financing of the European states after WWII and the risk of them defaulting on their debts to their main creditor: the USA. Another of the reasons for launching this plan was that of putting a halt to the growing influence of the USSR within Europe. The countries that were occupied by the USSR or that fell under Soviet influence were forced to renounce American aid, though there was one exception, as Yugoslavia managed to take part in the programme. Spain and Finland remained without aid for having collaborated with the Nazi regime. 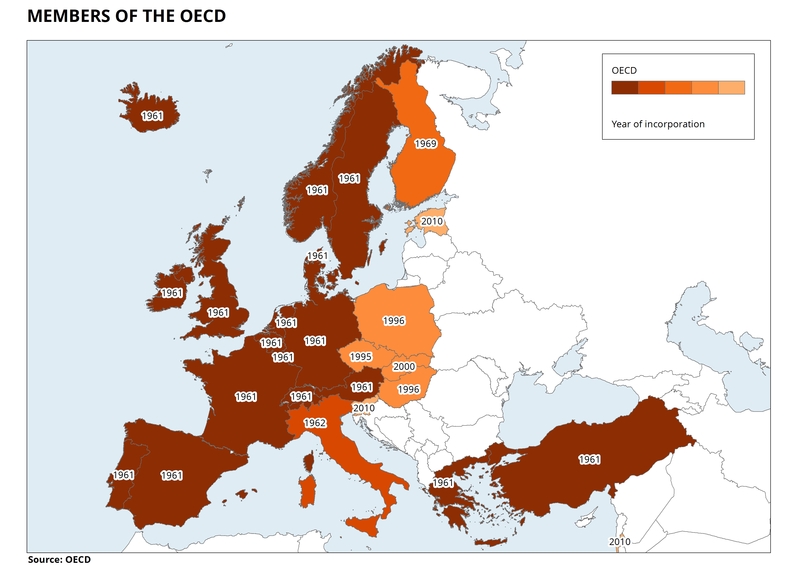 In 1948, the European Organisation for Economic Cooperation (EOEC) was created in order to manage these funds and became the Organisation for Economic Cooperation and Development (OECD) from 1961 onwards. >15 Distribution of the Marshall Plan funds in Europe, 1948 – 1951 I. Showing the percentage of aid received by each country. 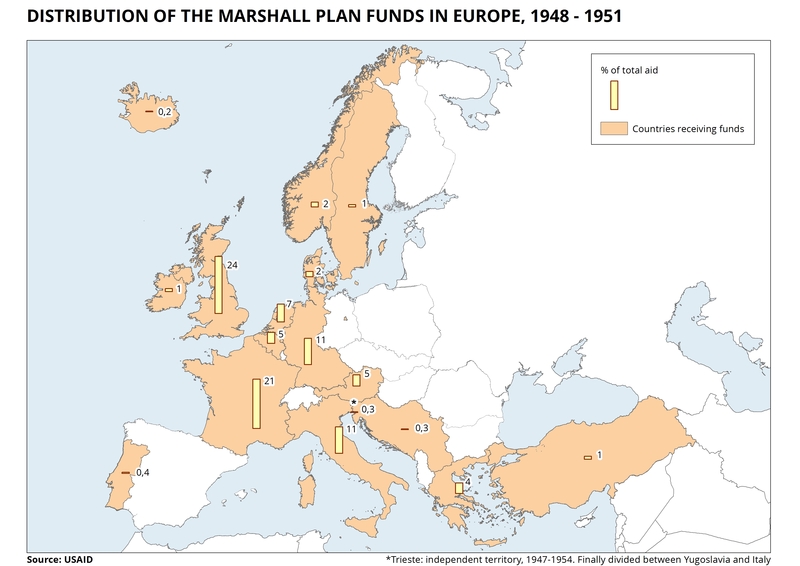 >15 Distribution of the Marshall Plan funds in Europe, 1948 – 1951 II. Showing the amount of aid per capita received by each country. >15 Members of the OECD. Map showing the members of the Organisation for Economic Cooperation and Development by year of adhesion. >15 Europe. Denmark, 1991. 113’. >15 Distribution of Marshall Plan aid by countries (1948 - 1952). The table also shows the increase in GDP between 1949 and 1952 for each country.